Gustav Mahler was one of the supremely gifted musicians of his generation. His contemporaries came to know him as a composer of startling originality whose greatest successes with the public never failed to provoke controversy among the critics. As a conductor, his relentless pursuit of perfection was sometimes viewed as tyrannical by the singers and musicians who came under his baton. Professor Henry-Louis de La Grange has devoted over thirty years of painstaking research to this study of Mahlers life and works. His biography, ultimately to be completed in four volumes, is drawn from a vast archive of documents, autographs, and pictures, assembled by La Grange at the Bibliotheque Musicale Gustav Mahler, Paris. 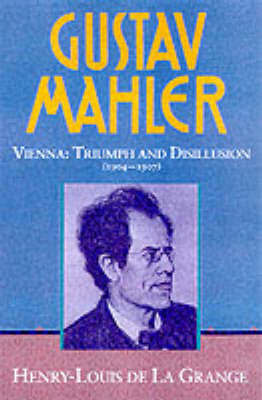 This third volume covers the years 1904-1907 and shows Mahler in his final years at the Hofoper coping with the rival demands on his energy and creative powers of the Opera on the one hand and his continuing struggle for recognition as a composer in his own right on the other. The first signs of marital difficulties with Alma emerge. Mahlers trials culminate in 1907 with the death of Putzi, his eldest daughter, a terminal crisis at the Opera which makes him decide to leave Vienna, and the alarming diagnosis by the doctors of a cardiac deficiency. True to life portraits are drawn of Mahler the human being, the family man, and the composer, as well as the administrator, producer, and conductor at the Vienna Opera. Innumerable testimonies and anecdotes throw new light on the many aspects of Mahler's complex personality.